Individual investors continue to be in an optimistic mood, although bullish sentiment did see a slight decline in the latest week. 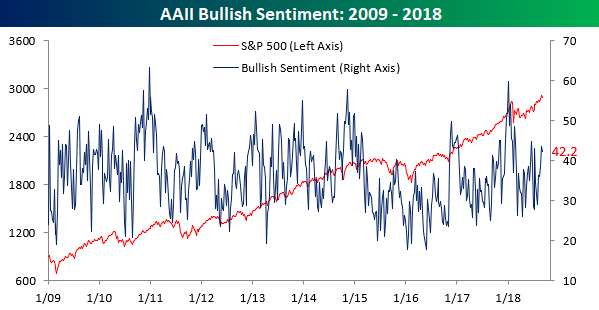 According to the weekly survey from AAII, bullish sentiment dropped from 43.5% down to 42.22%, which is still on the high side of the recent range. 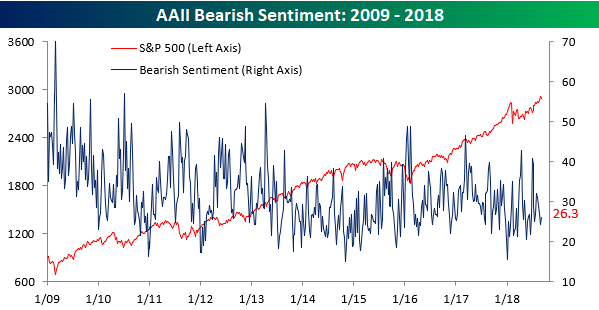 It’s also the first back to back weeks where bullish sentiment has been above 40% since February. Given the relative weakness in equities this week, one could argue that it’s a bit of a surprise that bullish sentiment didn’t fall further. With the slight decline in optimism this week, bearish sentiment ticked slightly higher, rising from 24.39% up to a still relatively low level of 26.3%.